I plan to run a circuit with two 18650s in parallel to get 7Ah of capacity and a 3.3V rail (for running the ESP32 MCU). I'll use an LDO to get my 3.3V until the battery voltage drops to 3.3V. At that point, I'd like to use MOSFETs to rearrange them into series configuration for charging via 2-cell balancing and charging ICs (inspired by this Adafruit product but in reverse). I'm wondering how to set up my MOSFETs to achieve this. 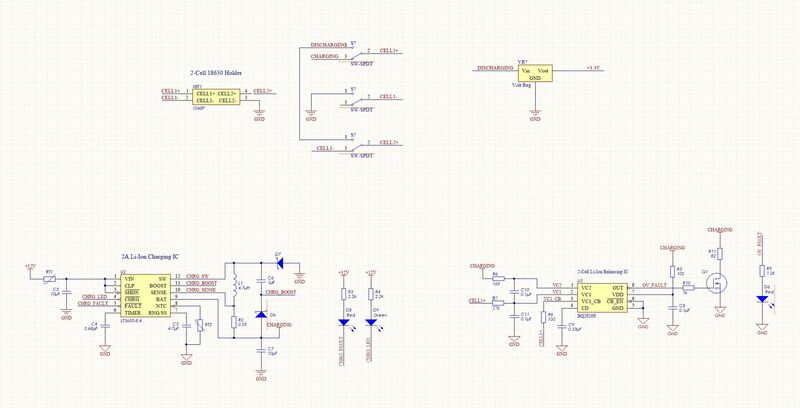 I could use P-channel enhancement-mode MOSFETs that are by default ON if the gate voltage from the batteries is >3.3V and then shut off when the voltage drops below 3.3V to open up a new branch. I've modelled this below using SPDT switches for readability. Would it be better to turn the MOSFETs on/off via a digital signal from the MCU? I could monitor the battery voltage using a comparator and some code and have it all controlled in software. That way I don't have the output of my pack voltage driving the switches that are reconnecting the output of my pack voltage. Browse other questions tagged mosfet lithium-ion or ask your own question.